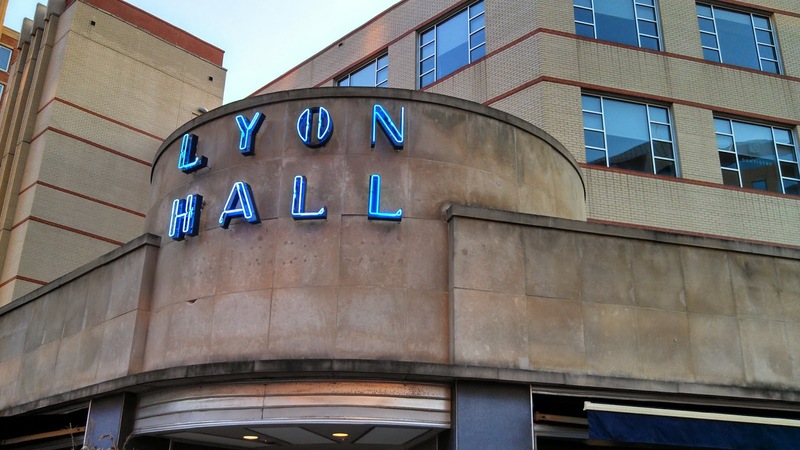 On Tuesday night, Bell's Brewery of Kalamazoo, Michigan, competed with beer selections from Lyon Hall restaurant in Arlington, Virginia. 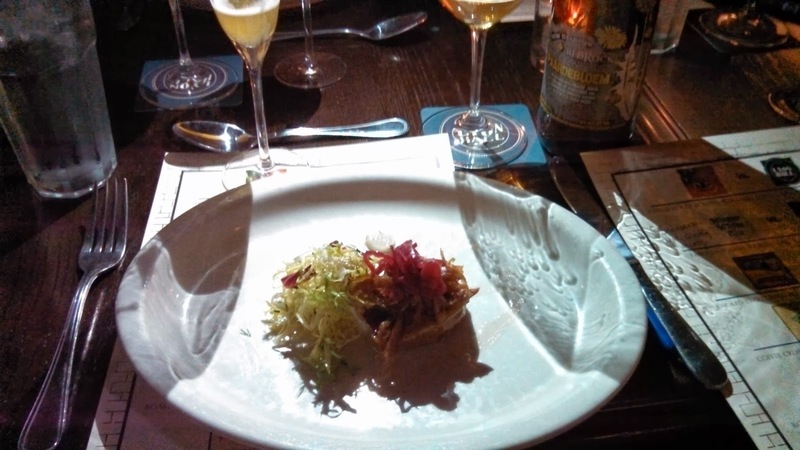 The Lyon Hall vs. Bell's beer dinner featured a five course meal with each course accompanied by one beer selected by Lyon Hall's beer director David McGregor and one beer chosen by Bell's. The diners then chose which beer better suited each course, not necessarily which beer tasted better on its own. I attended last month's beer dinner when Founders went head to head with Lyon Hall, and I was interested to see how Bell's fared against McGregor. Plus, the food was so good last month that I wanted to try more creations from Lyon Hall's chef. I am not sure what thistle honey is (or is it thistle and honey? ), and duck fat is not something I usually ask for at my local supermarket, but this course was surprisingly enticing. My wife normally does not like duck, but she enjoyed the duck confit. Wheat beers are generally a hit or miss with me. I tend to like darker, more robust beers, but an occasional wheat will surprise me. The Winter White Ale on its own did not make a strong impression on me. It was a little too light for me, and had too much of a lemony flavor and soapy texture for my taste. I enjoyed the Paardebloem (do not ask me how to pronounce this) better. It was fruity, but not overbearingly fruity, with a predominantly peach taste. It was refreshing and easy on the palate. Ultimately, I felt that the Winter White paired better with the pear and duck. The peach flavors of the Paardebloem almost drowned the flavor of the food while the Winter White's flavors seemed to enhance the taste of the duck and pear. The soup was excellent. Despite being squash soup, it had a strong pumpkin flavor. This was probably due to the pumpkin seeds lining the bottom of the bowl. The seeds contrasted with the softness of the squash, giving the soup a more substantial texture. My notes describe the Midwestern Pale Ale as "a nice pale ale." And that is what it is. It is not the most memorable Pale Ale I have had, but it is pleasing. It does have a slight hint of orange to it, but, like any good Midwesterner, the pale ale is not too flashy and just gets the job done. I generally do not like pumpkin beers, but the Gruntled impressed me. The pumpkin flavor was subtle, and unlike most pumpkin beers, it did not make me forget that I was drinking beer instead of a pumpkin-flavored soft drink. Overall, if I were choosing a beer to drink on its own, I would pick the Midwestern Pale Ale. However, the Gruntled's pumpkin flavor tasted better with the soup. Its flavor complemented the pumpkin in the soup without overpowering it. Lyon Hall's trout was popular with all four diners at my table. It was prepared well and the saltiness of the bacon enhanced the flavor of the fish. Bell's originally planned to serve their porter with this course but had to make a last minute change to their Kalamazoo Stout. The stout was not too heavy, so I did not feel like I was eating a meal while drinking it. The stout was smooth with a slightly smokey finish. It was utterly enjoyable. The XH is an interesting beer. It is a Belgian Dark Ale brewed in Japan. The beer matures in distilled sake barrels. I could taste a familiar hint of sake, but it did not overshadow the ale taste. It is a good beer, but I would not order it on a regular basis. The XH did remind me that it has been too long since I have had sake though. Despite my preference for the Kalamazoo stout, I felt it was just a little too dark and smokey for the fish. The sake hints of the XH did not linger in the mouth and allowed me to enjoy the fish. I do not normally enjoy venison, but maybe I have not had it prepared right. Lyon Hall's venison was more tender than most. The sauce was rich and dark and when combined with the risotto and venison made the dish feel heavier than the other courses. When I saw Bell's Amber Ale on the menu, I thought it would win this round. I have had it many times before and know that it is a good beer (although I would rank Bell's Oberon, Best Brown and Two Hearted higher). It is a simple, refreshing and pleasing amber that would be enjoyable with most food. But then I tasted the Black Rye IPA. It was a revelation. My notes just say, "Amazing beer." It is dark in color, but not very dark in taste. My wife called it "grapey," but I do not know if that is the right description though. It felt like there were many layers too it, and I am not even sure if I made it past the surface. I suppose the only way to uncover its layers is to try it again. 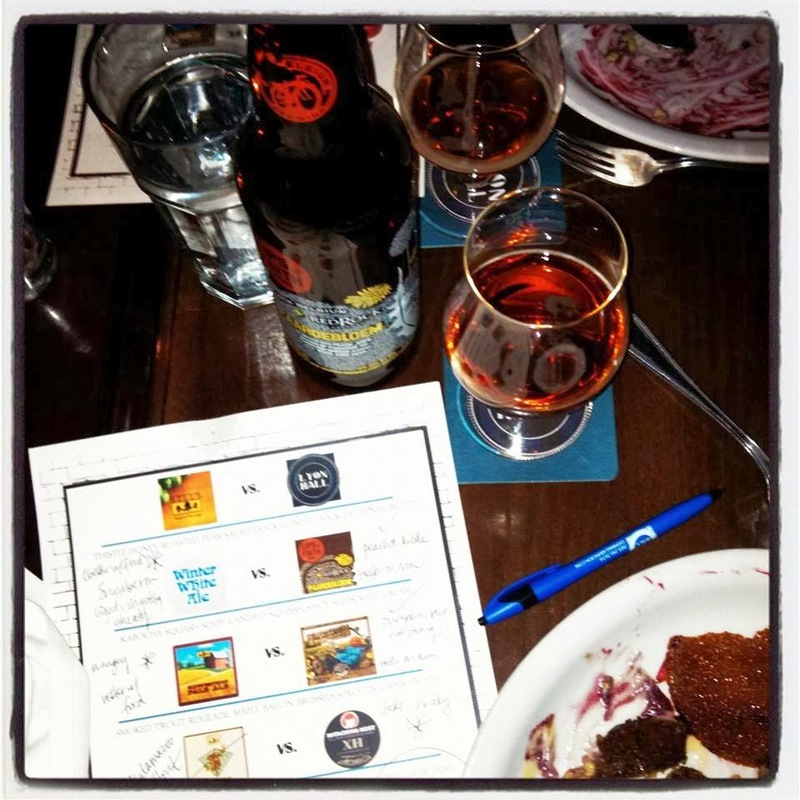 In this round, the better beer also paired with the food better. Maybe I liked the venison because of the IPA. Maybe it had nothing to do with the way it was cooked. The dessert was the least impressive of the five courses. I would never order a bread pudding for dessert at any restaurant, so my own bias probably skewed my feelings for this dessert. The bread pudding was not bad, but it did not compare to the dessert at the Founders dinner last month. I had never tried the Double Cream Stout before. It was sweet for a dark beer, yet it still tasted strong. I would not order it on a regular basis, but it did go well with the banana and maple flavors of the dessert. The Bromigo was too much. With four people at our table, this beer got eight thumbs down. One friend said it tasted like "bacon wrapped cigar." To me, it just tasted like a really strong, high alcohol content beer (I later was surprised to see that it is only 6.5% alcohol by volume). It seemed to assault the senses, as if it wanted to prove it was a tough beer. This round was a clear victory for Bell's. After the dinner was over, McGregor asked the diners to vote for their favorite beer for each course. The diners chose Lyon Hall's beers for rounds three and four and Bell's for rounds one, two and five, making Bell's the victor on this night. Overall, this meal, like last month's, was an amazing experience. Bell's proved its worth as a brewery, and Lyon Hall once again had me walking away with a desire to come back for more.